"To work, without love is slavery." Do what you love and you'll love what you do. For our desires and gifts work perfectly together - if we allow them to. How? Because the King of Kings made both. And He did this with perfect knowledge of us in mind, because He created us! Don't feel like what you want to do is insignificant. It's not. God put those desires there for a reason - because in some way, shape or form, what He has called you to do - aka what you want and feel driven to do, is going to work perfectly in His Divine Will. ...if you are living a prayerful God driven life that is. So don't think that what you want doesn't matter - pray, listen and act! Pray for guidance that God will lead your life in His direction. Listen to the call you hear in your heart. 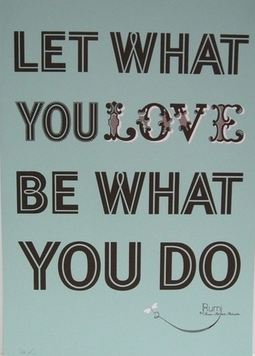 Act out what you love and act it out in a joyful manner! GIVEAWAY - Happy National Nutrition Month!